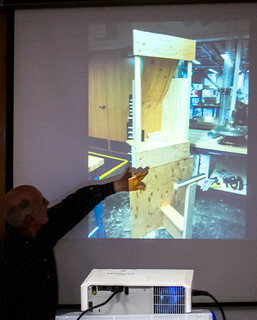 I was first made aware of Tim Hunkin while reading through Russell Davies’s wonderful site, and then the opportunity fell into my lap to see him talk at the new Cambridge Makespace building last night. Tim was talking about his weird and wonderful arcade machines on Southwold pier. They’re marvellous in the original sense; they are works of real devotion and an awkward beauty. They might look almost naive at first sight, but under the hood they’re incredibly clever. It left me with a big grin on my face, and lot to think about. The thing I most admire about Tim is not his fantastic engineering skills or his imagination, but the conviction needed to turn his ideas into reality. I’m guessing this conviction has been accrued over many years, to the point where deciding to set up a totally off-the-wall arcade featuring machines about Somali Pirates seemed like a viable idea. I’m sure many people have silly ideas for machines, but Tim is one of the only ones Getting It Done. The rest of us just have an in-built Silliness Filter that cuts such lunacy out of our lives. I hope I’m starting to shed mine, slowly. 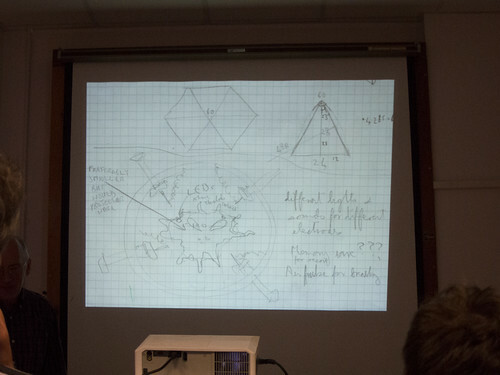 Here’s his paper design for his latest “Alien Probing” attraction. Wonderfully silly. That thing in the circle is a baby alien with probes you can poke into it. In some ways, Tim’s machines are a physical manifestation of the Silly Ideas of the early home computer games (think Manic Miner, or Chuckie Egg, or even Mario), and the renascent Indie Games scene. But those lack the “Magic of the Physical”. Most of the machines, like Microbreak or the Expressive Photo Booth, are not even games — they’re experiences. They’re much more like the entertainments of the early circuses, even if they are made from parts of a broken Space Harrier machine with a sofa attached. A lot of the development is similar to video games: there’s a prototype that his user testers (grandchildren) play; there are paper designs that last until something is built; he uses known technology that he’s comfortable with and which provides a quick turnaround for experiments; he has an immovable ship date (the start of the summer season) to work back from; and he gets concrete feedback at the end, namely the number of coins he pours out when he visits the arcade. Actually scratch that, that’s nothing like big video game development. I’m in the wrong job. I’m already planning my trip to Southwold, to provide Tim with a few more coins to scoop up at the end of the week. Thanks to the Cambridge Internet of Things Meetup group for organising the evening. It was great!